Shirts With Random Triangles: Lane Kiffin compares Nick Saban to Pete Carroll. Is this a good thing or a bad thing? Lane Kiffin compares Nick Saban to Pete Carroll. Is this a good thing or a bad thing? 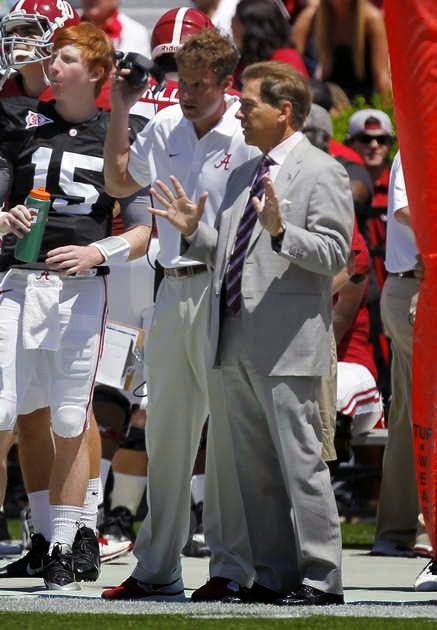 Lane Kiffin and Nick Saban. Photo via al.com. Straight from the "Is this a good thing or a bad thing?" department word that first-year Alabama offensive coordinator Lane Kiffin has publicly compared his current boss, Alabama head coach Nick Saban, to his former boss at USC, Pete Carroll. Kiffin made his comparison after being asked to do so while speaking at the DEX Imaging 20th annual L'Arche Football Preview in Mobile, Al. on Thursday. "To see their systems, they're completely different," Kiffin said. "But I think it reminds us in all our business, in everything that we do, it's not really what you do, it's about how you do it. Both those guys have exact beliefs and philosophies in everything that they do. Now they're completely different in how they do them, but they have a philosophy and a belief and the players and everybody in the building and in the organization understands that. "As different as they are, that's really how they're so similar." Considering that Carroll's departure from USC came as the program was engulfed in the Reggie Bush scandal, which led to the school's 2004 BCS title being vacated, 'Bama had better hope that is no way, shape, or form anything like Carroll.